I’m very excited to have joined MusicWorks! Asheville as a teaching artist last week. MusicWorks! is an El Sistema inspired after school program for children in Asheville, NC. It’s under the direction of Brian Kellum. We’re working with students at Hall Fletcher Elementary School, along with Hall Fletcher music teacher, Melody McGarrahan. MusicWorks! is an intensive artistic and social program inspired by Venezuela’s El Sistema, offered after school in the city of Asheville to children in underserved populations that uses music education as a transformative and Empowering tool to teach life skills. Right now we’re starting with kindergarten and 1st grade students. Next year it will expand to include the rising 2nd graders and include new kindergarten students. It’s our goal to grow the program every year in this way. MusicWorks! Asheville was the recipient of a grant given for music education to the Asheville Symphony Orchestra. I’ll be playing and directing the Asheville Jazz Orchestra again at our monthly show at the White Horse Black Mountain in Black Mountain, NC this Saturday. The first set of big band jazz starts at 8 PM. I’m excited about a couple of “subs” who will be playing with us. Visiting from Michigan State University, Joe Lulloff will be playing alto sax. Brad Jepson, one of the co-directors of the Greenville Jazz Collective Big Band, will be playing in our trombone section. It should be a particularly hard-swinging band this time around, so I’ve put a bunch of challenging charts in the set list. If you’re in the area, come on out. At any rate, it’s Friday and here are some of my picks for your music-related surfing this weekend. Enjoy. I’m involved in a few nonprofit organizations devoted to music education and end up performing at fundraisers from time to time. Chris LeDrew makes a compelling case for Why Musicians Should Never Donate Their Talents. DarwinTunes has put together an interesting musical project. Using loops and they allowed the music to evolve through public choice. You can listen to some of it, and participate yourself, at their web site. If the ensemble has to stop because of you, explain in detail why you got lost. Everyone will be very interested. I had bookmarked this page with a black and white photograph of Louis Armstrong In Egypt. It talks a little bit about the United State’s “jazz diplomacy” during the Cold War. Coincidentally, I recently came across a very well done colorized version of the same photo (and 53 other colorized historical photos). And to finish off this week, if you ever suffered from self-defeating thoughts about maybe not just having the natural ability to play music, watch this amazing horn player. Wendy sent me the following question about how to communicate your musical directions to a jazz band. If I’m going to sit in with a trio for the first time at a club, and I want to do Autumn Leaves the “first time around” very slow (do you say rubato in jazz lingo? ), but then the second time upbeat, how do I communicate this to the trio? Thanks! I’ve written a bit before on suggestions for counting off the band on tunes. There’s nothing really difficult to learn in there, but it’s a somewhat neglected topic that most people learn intuitively over time. Read the above link for more details, but in a nutshell you want to be confident with your tempo and also make sure that your count off also reflects the style and groove you want. I think most jazz musicians would understand “rubato” just fine. From your description, my assumption is that you want to sing (or play, if you’re an instrumentalist) the first chorus rubato with maybe just a piano accompaniment and then go into tune with an upbeat swing groove. Just explain that to the trio and they will be familiar with this common road map. One of the nice things about Autumn Leaves is that the melody has a pickup into the first measure. This pickup is long enough that the band can easily get your tempo from how you start the 2nd chorus, rather than needing you to count in your tempo. To make it easier on the band explain before you start that you’re going to play the first chorus rubato with piano and your pickup into the 2nd chorus will set the tempo. If they know the tune (and they probably will know Autumn Leaves) you probably don’t need to also warn them about the style (swing, latin, etc. ), but you can’t always leave this to chance, so it’s best to explain the groove you want too. It might also be helpful for you to even give them an example of the tempo you plan on going to on the 2nd chorus before you start in case they are feeling it differently than you ahead of time. You will want to be certain that your pickup is solidly in the tempo you want and don’t embellish the rhythms to the point of where it’s not obvious where the beat lies. It’s worth practicing this on your own (and in rehearsals with other musicians too). Sometimes a rhythmic embellishment we think is cool makes it harder for the rest of the band to follow your tempo. Simpler is usually better in this case, but you can take this too far and sound corny or confuse your band if they’re expecting something hipper. Have fun sitting in with the trio! Embouchure Type Questions: Which Type Is Right For You? Tristin sent the following question to me about his embouchure. Hi! I am a sophomore at a fine arts school and I love to play the trumpet in band. However, while I was playing one day, I noticed that I change embouchure to play different registers of the trumpet better. I then tried experimenting to find a suitable embouchure for me to play the full range of my instrument, but I found that I can play pretty much the same with all the embouchure types you wrote about: very high, medium-high, and very low. This confuses me greatly, and I do not know which embouchure is best in the long run according to my anatomy. i find myself constantly switching between the three every time I play to try and find which one is best. To worsen the situation, I started to develop a double-buzz and my playing is going downhill. Which embouchure setting is best for me? I’m not sure if this helps, but I have an overbite, though I seem to even the teeth when I play. Thank you. As always, I can’t offer specific advice without being able to watch you play (preferably in person). I don’t teach video lessons for embouchure troubleshooting because I don’t find them conducive to troubleshooting, but sometimes I can spot something if you are able to post a video of your playing. Check out what I wrote here for what I need to see in order to help you out. While I can’t tell you which embouchure type is going to be best for you in the long term without watching you play, I can speak generally about your situation. Keep in mind that everyone is different and what I’m saying here may not necessarily apply to you. Sometimes players will want to practice in a way that helps make a correction and then go back to another way of playing later. Which brings me to my first general point. Assuming your the typical age for a high school sophomore in the U.S., your anatomical features that determine which embouchure type is going to work best for you may change around. Some folks continue to grow up until they’re about 21 years old. Even older brass musicians will sometimes find embouchure features changing around as teeth naturally shift or as they develop as players. Even if I could be there to watch you play it might be that you just need some more time playing before your embouchure type settles down. This is far more common than most people realize. It can be very frustrating for a player, particularly if they have no idea why they’re struggling. Rather than worry about what embouchure type you should be playing on, it may be better for you to practice developing good embouchure form. While embouchure characteristics vary from player to player, there are some good rules of thumb for all players that will help you use the most efficient muscles and develop the strength and control you’ll need when your embouchure type settles down. One exercise I like to help players develop strong chops is the free buzzing exercise I wrote about here. Just a little bit every day long-term is best with this exercise. Don’t overdo it and remember it’s just an exercise, not a method to diagnose your embouchure. Think of it like weight lifting for your chops. Regarding your double buzz, it’s entirely possible that it’s being caused by you shifting your mouthpiece placement all around trying to find your best embouchure type. Since I suggest you not worry about your embouchure type for now, pick a placement that’s not too centered and stick with it for your entire range as much as you can. Usually I will recommend starting with the placement that works best for your high range and practice descending from there. That said, there are too many exceptions for me to say this should be universally followed. A double buzz can be caused by several different things. I’ve written about it here for some further information. You mention you have an overbite and bring your jaw forward to more or less align your teeth when you play. That would suggest either a “very high placement” embouchure type or a “very low placement” type, because for these players this jaw position is most common. Again, there are too many exceptions for this to be a truism. Also, just because you’re protruding your jaw to play now doesn’t mean you’ll always want to or that this is necessarily correct for you now. Much like your best embouchure type, I wouldn’t be too concerned with what your jaw is necessarily doing right now beyond keeping it more or less in place and reducing or eliminating a jaw drop to descend. Since you’re studying at a fine arts school you are probably getting exactly the sort of instruction and experiences you need to get better. While I hope that I’ve been able to give you some helpful ideas, your best resource right now will be the teachers and instructors you get to work with in person. Have fun and good luck! I’ve got a couple of upcoming public gigs coming up in the next three days. Tomorrow, (July 19, 2014) I’m playing traditional jazz with the Low-Down Sires at a lindy hop dance called The Process in Richmond, VA. I’m afraid I don’t know more of the details about the dance, but if you’re a swing dancer in the area or just a fan of trad jazz you can probably get in touch with someone through that Facebook link above. 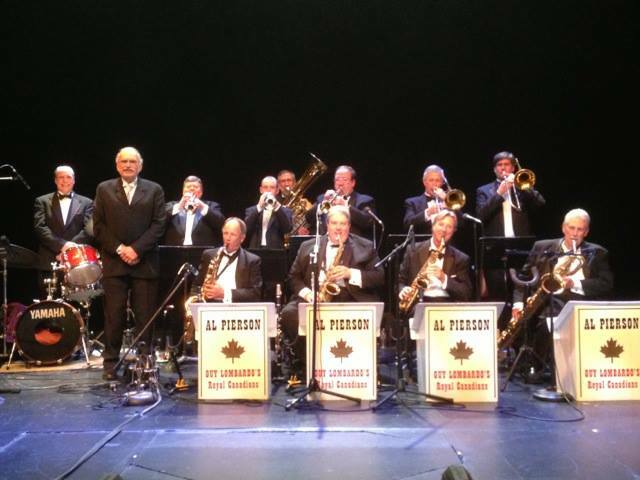 Next Monday, (July 21, 2014) I’ll be sitting in again with the Greenville Jazz Collective Big Band. We’re playing at Grille 33 in Greenville, SC. If you get to come out to either, please be sure to say hello to me. If you’re too far away to come hear me play, here are some of my music related links for your weekend surfing. Nikolaj Lund is a photographer who takes photos of classical musicians and puts them into a unique perspective. Take a look at some of them on his web site. Hal Crook is a fantastic trombonist, composer, and the author of some of my favorite books on jazz improvisation. The Berkley College of Music, where Crook is on the faculty, has posted a downloadable library of play-a-long tracks Crook put together for improvisation practice. An old manifesto from 1992, Dennis Báthory-Kitsz urges musical organizations that It’s Time to Bury the Dead. Here’s a quote to whet your appetite. Is there anything new on the menu of the Vermont Mozart Festival or the Killington Music Festival? Does either the professional or amateur musical community of our state and beyond show any commitment at all to the music of their own age? Indeed, does the listening public have any clue what a wealth of music is consciously and maliciously being denied them? No, no, no and no. Of course not! Pleasant advisory committees, cheerful compromises, and polite accommodations are doomed because such efforts attempt to deal with a special, entrenched group of diseased minds called necrosones, those who make their living by exhuming, stuffing and mounting the music of dead composers –composers who demand neither royalties nor attention to the artistic thought behind what they once did. Necrosones will never change because they cannot, because they are not artists nor are they sympathetic to art. They are vampires. To finish things off today, here’s Oleg Berg’s treatment of the classic Beatles recording Hey Jude, but tweaked to put it into a minor key. One of the things I love about great music is that it is often still strong when it gets twisted around like this. Embouchure Question: Does Trombone Playing Develop Trumpet Endurance? Here’s another question from way back (February!) that I’m finally getting around to. First of all, many thanks for all the information you make available here. It is invaluable. Here’s my question, in a nutshell – Will picking up the trombone and practising for, say, 30 minutes a day help a cornet / trumpet player develop their endurance, beyond what they would get by just playing their main horn? I understand this might vary from case to case, and on the quality of the embouchure on both horns. But assuming an efficient (even if not highly developed) embouchure on both horns, would you say this would generally help from a purely “muscular” point of view? Could it even prompt a more efficient embouchure by “forcing” the player to “do things right”? A little bit about me if you don’t mind – I’m a comeback cornet player after a 5 year break. My range and endurance were never great. I never got above, say, a G on the staff. The good news is – I don’t care about range too much. As an amateur trad jazz player, I don’t want to hit screaming high notes. As long as I can play within that range comfortably and play a singing solo, I am happy. So my main concern is really endurance. I still find myself struggling sometimes about 6 months into my comeback. I would love to meet you in person, but I live in London so that would unfortunately not be possible any time soon (hey, who knows, I might be coming to New England some of these days). Sooner or later I might make a video as and send it to you to have a look at if you don’t mind, which would of course be much appreciated. Many thanks again for all your time and effort you put into the site. Sorry if this turned out to be a long message! This is really a good question, and to be honest I don’t have a very firm answer for you. I used to double on the different brass instruments, but I found it difficult to keep all of them up and especially had trouble moving from low brass to high brass. These days I infrequently play brass other than trombone, but I also have a much better understanding of how my embouchure works than I did when I was doubling seriously. As a result, I can play with a pretty decent range on any brass instrument, albeit with limited control and not such a good sound on high brass. Most of the time when I pick up a secondary instrument it’s in a teaching situation to either demonstrate something or fill in a missing part. I do still sometimes practice trumpet in order to work on some specific things for my trombone embouchure. Occasionally I’ll play a low brass secondary and I find adapting to the valves more tricky than a different mouthpiece on low brass. I think brass players can learn a lot about how to play their primary instrument by practicing other brass instruments. Generally speaking, going from something smaller to something larger (trumpet to trombone, euphonium to tuba, etc.) can help many players learn to move air better and relax the embouchure formation. Many trumpet players will play some trombone as a warm down (in fact, I recommend trumpet players who practice lots of pedal tones replace that with trombone playing). Moving from larger to smaller (tuba to trombone, euphonium to horn, etc.) can often help players learn how to focus their air properly for their upper register. I don’t have the source at my fingertips (so take this with a grain of salt), but I recall that Arnold Jacobs (I think) once measured the air pressure required to play the exact same pitches on different brass instruments and found them very similar. For example, a trombonist playing a B flat above the bass clef staff will use the air similarly to playing a written C in the treble clef staff on trumpet (both Bb 4). There’s also probably some good strength building in the embouchure musculature that helps translate when going back to the lower brass instrument. As you suggest, practicing on a secondary brass instrument with a significantly different mouthpiece size can force you to “do things right,” or at least to help you move into a more correct direction. I feel it’s best to go into such practice with an understanding of what specifically you’re going to work on and to carefully monitor your playing so that you can avoid picking up the wrong things or going too far in one direction. If you’re finding it beneficial to your primary instrument keep practicing your secondary, but don’t overdo it and get too much of a good thing. Likewise, if it’s causing problems you should dial it back or even eliminate it for a while. To all the other brass doublers out there let us know what you feel in the comments below. Do you find practicing a secondary brass instrument beneficial to your primary instrument? Do you find differences going from a larger to smaller compared with going smaller to larger? I really need to go through my inbox and respond to all the good questions I’ve gotten. This one is from January. Hello, Dr. Wilken. My name is Kevin and I am a college sophomore who plays the trombone, and I just had a few questions. First, I would like to ask what the relationship is between free buzzing and buzzing on the mouthpiece alone. I can free buzz a little bit, but I do not do it often. And I can buzz on the mouthpiece fine although I wasn’t really able to when I first started playing which was about 3 years ago. Should you be able to free buzz a note and translate that into mouthpiece buzzing? Also, what would be the best thing to do to try and play with great tone? A lot of times when I play, I play with a nasally sound, and I really want to fix that. I realize that I should probably already know the answers to these questions since I have been playing for a couple of years, but my initial training wasn’t too informing because I switched somewhat spontaneously about halfway through high school. Thank you very much for your time. There are similarities between free buzzing, mouthpiece buzzing, and playing your brass instrument, but there are also some important differences. If you’re clever and understand how your embouchure should function (or have proper guidance from a teacher) you can use buzzing to enhance your playing. If you’re not sure what you’re doing or are working under a false assumption, you can develop habits that potentially work against your playing. In order to put this into context you need to have a basic understanding of the different brass embouchure types. Of the three basic types, two place the mouthpiece higher on the lips and are considered downstream embouchures. The third is less common, places the mouthpiece low on the lips, and is upstream. You really can’t choose your embouchure type, the one that works best for you is dependent on your anatomy, not your teacher’s embouchure or what player you want to emulate. One of the reasons why this is important is so that you broaden your understanding of the influence the mouthpiece and instrument have on how your embouchure functions. Consider first that when buzzing, either with the mouthpiece or lips alone, you don’t have the instrument slotting the correct pitch according to the overtone series. This means that you can be a little bit off with your embouchure firmness for any given note and the horn will force your embouchure into the correct pitch, assuming you’re close enough. Try taking a legato phrase or three from a Rochut etude or something similarly lyrical. Play those phrases on your instrument first and make sure you know what the pitches sound like, then buzz it on your mouthpiece. When you buzz it, I recommend you eliminate tonguing from the equation and only allow yourself to tongue the initial attacks after taking in a breath. Don’t worry too much about glissing between pitches, although if you can accurately mouthpiece buzz without sliding from note to note you should. Immediately after mouthpiece buzzing pop the mouthpiece back into the instrument and play the passages on your instrument. Usually after this sort of practice players will find that their playing feels easier and the tone sounds more focused and resonant. Mouthpiece buzzing correctly will force you to focus the embouchure vibrations perfectly, rather than relying on the instrument to help slot the embouchure for you. It also requires more air to mouthpiece buzz. When you transfer the feeling of mouthpiece buzzing to playing the instrument it can make the playing more efficient in these ways. However, often this feeling and improved timbre go away after a minute or so of playing. Furthermore, it’s pretty easy to mouthpiece buzz in a way that isn’t so conducive to good playing, but works great on the mouthpiece alone. Because of this, and also because the improvements you’re working on with mouthpiece buzzing can also be developed in other ways, I hesitate to recommend mouthpiece buzzing unless I am able to show a player how I prefer to approach it and how to avoid problems. In a nutshell, try to mouthpiece buzz with the exact same embouchure formation as you play with. Don’t let your lips get blown more into the cup when buzzing than how you normally play. It may feel to you like this is a good thing when you transfer it to the instrument, but I don’t feel this practice is sustainable in the long term for most players. Free buzzing is also a different animal from playing and mouthpiece buzzing. As an upstream trombonist, I use free buzzing in my own practice purely as a strength building exercise. I feel that all players can benefit from some simple free buzzing exercises for just 2-5 minutes a day (follow my link above on free buzzing to learn about one exercise). Many downstream players can also benefit from free buzzing into the instrument. For downstream players at an appropriate stage of development free buzzing a pitch and then bringing the mouthpiece and instrument up to the lips can help them find the most efficient mouthpiece placement, horn angle, lip position, and fine tune other embouchure characteristics. For upstream players, and some downstream players, this exercise will work against your playing, so use at your own risk. Regarding your question about playing with good tone, it’s difficult to offer specific advice since I haven’t been able to watch you play. Mouthpiece and free buzzing can help, if done correctly, but could also potentially mess you up if overdone or practiced wrong. Don’t forget the importance that breathing and tongue position have on your tone quality too. There are times in a player’s stage of development where it might be better to accept a thin sound short term in order to practice playing correctly long enough to develop the knack for opening up the sound. Guidance from an experienced teacher with regular lessons will go a long way here compared to advice given over the internet. You mentioned you’re a college student, but not if you’re enrolled in trombone lessons at school. Most colleges offer private music lessons for credit, even if you’re not a music major, so check that out in the fall and see if you can get weekly lessons. Even if you already study from your college trombone professor, you might try visiting another teacher for a lesson from time to time and get a different perspective. Yes, I’ve been slacking off on keeping up on posts lately. I haven’t, however, run out of random music related links to recommend for your weekend surfing. I wasn’t familiar with Geraldine Evers before. She plays bass trombone with Orchestra Victoria and is the woman to hold a permanent trombone position with a major Australian orchestra. Even if you’re not a fan of the prog-rock band Queen, you’re probably familiar with their tune Bohemian Rhapsody. Learn about it’s story, compiled and discussed here. Here’s a good dictionary of Musical Terms and Definitions. Here’s an example. Here’s a photo of me doing my best to play schmalzando. I’m the trombonist on the far right here. Do you have a tune that you just can’t get enough of? If you want to listen to an infinite, yet still ever changing version of that track you can upload it to The Infinite Jukebox. For fun I tried it with a 10 piece trombone choir composition I wrote. Not sure if this link will work, but you can always try out your own. It probably lends itself to certain styles. While the full results aren’t really all that exciting, some of those random moments are pretty interesting and could make for a composition exercise or method to come up with ideas. Lastly, Mick sent me a video of Weird Al Yankovic’s tribute to Frank Zappa, Genius in France. Two musician friends of mine simultaneously have come up with similar uses for velcro. 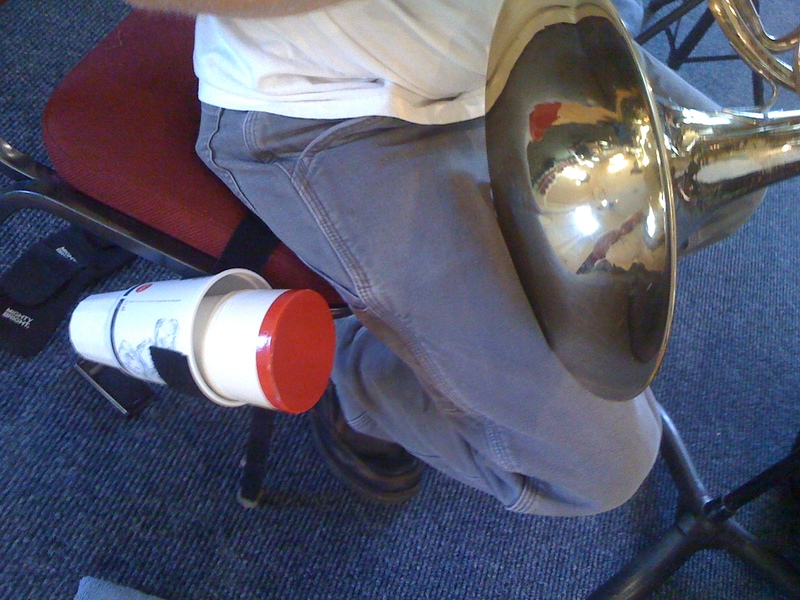 Bob, a horn player, designed his own mute holder using velcro strips and a large plastic drink cup. 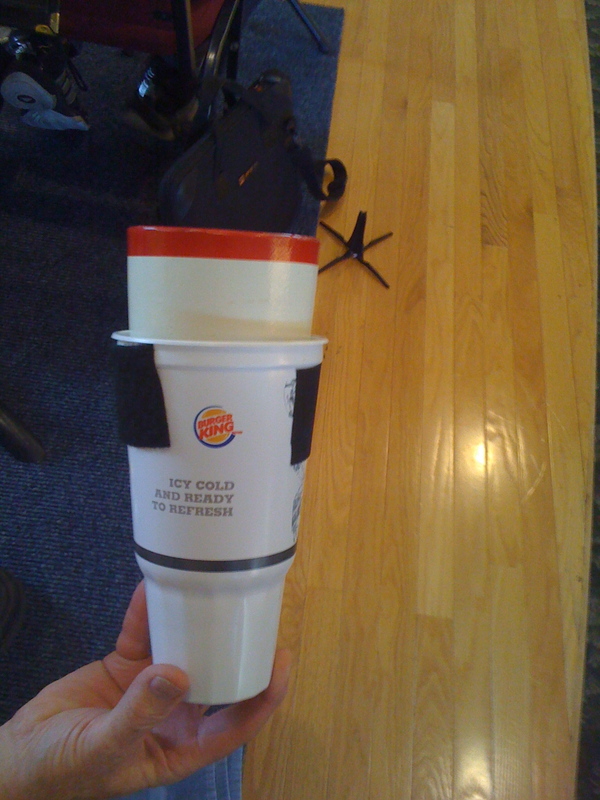 Start by gluing a strip of velcro around your cup. You’ll obviously need to find a cup that’s large enough to hold your mute. Not such a big deal for trumpet players, but probably impossible for tubists. 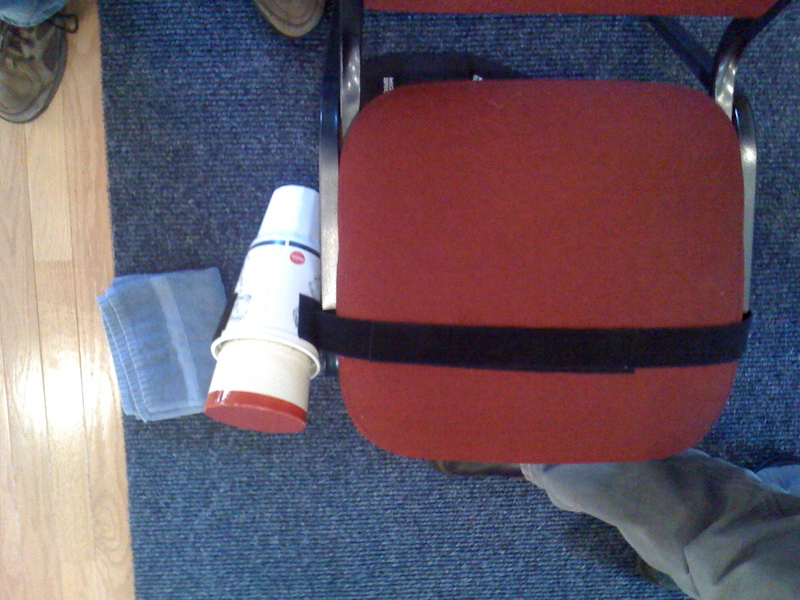 You’ll need enough velcro to next wrap around your chair. I imagine that it would be more comfortable to use the soft fabric-like strip hear, since you’ll be sitting on it. Save the plastic hook portion of the velcro for use on the cup. You’re all set. Your horn mute is right by your bell when you’re playing, making those quick mute changes much easier. Coincidentally, a bassist friend of mine, Michael, was unsatisfied with using the bow quivers most bassists use if they alternate between arco and pizz throughout a performance or rehearsal. Michael needed a bow for one tune on a gig we were playing together and the bow changes happened a couple of times and were immediate. 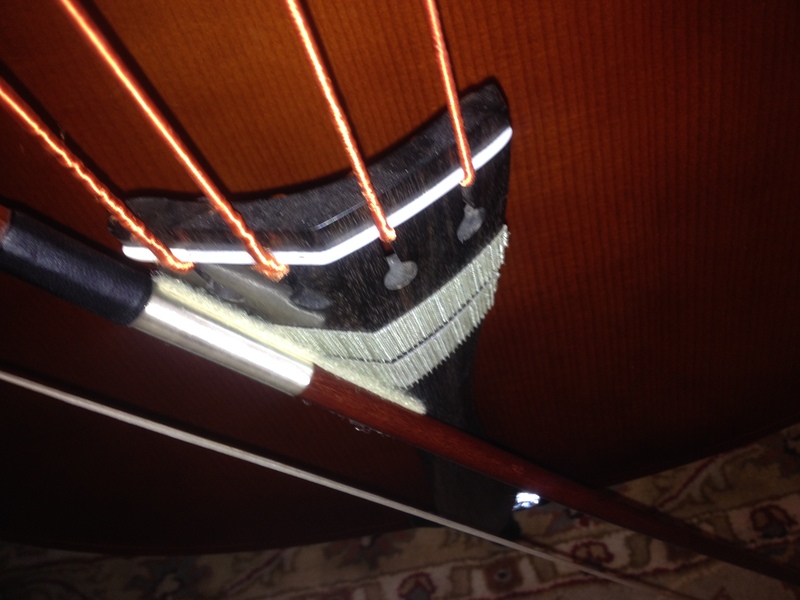 Since he mainly plays an older, slap-bass style on this tune he really couldn’t hold the bow in his hand when he wasn’t using it, so he used some velcro on his bow and the tailpiece of his bass to make for a very quick bow holder. Keep in mind that he was using this for one tune and he doesn’t use his bow for gigs much at all. If you have an expensive bow and need to change a lot during your show I’m not sure how much I’d trust it to stay put. Use at your own risk. What other musical uses of velcro can you think of? Off the top of my head, I was thinking that there might be a way to use some velcro to design an easy to reset method of holding sheet music on your music stand during outdoor gigs. I’ll have to give it some thought and see what I can come up with.